On a cold December night in 1758, a German farm-owner from Dresden stood resolute in the quiet, frosty air, spellbound at the image in the eyepiece of his telescope. It must have felt like a gift from the heavens. After all, it was Christmas night and Johann Georg Palitzsch had become the first person to witness the return of a long-awaited visitor; a tumbling snowball seven miles wide from beyond the orbits of Uranus and Neptune – as yet undiscovered worlds. The object in question was already a legend and its return had been foretold by one of the greatest astronomers of the age. Palitzsch knew he had recovered Halley’s Comet. In 1705, 18 years before Palitzsch was born, Edmund Halley – already a prolific scientist with decades of experience – lent his considerable intellect to the long-standing problem of comets, with the benefit of a deep understanding of gravitation. Two decades earlier Halley had edited the work of Isaac Newton, who had himself addressed the apparently strange behaviour of comets, demonstrating that his theory could adequately explain their motion. Halley undertook a systematic study of past sightings, and as a result presented to the world that most scientific of things – a prediction. He realised that four recorded apparitions in 1456, 1531, 1607 and 1682 could have been the result of one object in a periodic, highly elliptical orbit around the Sun. If he was right, his computed orbit suggested that the comet would return again in 1758. Halley went on to make broad contributions to science, many of which are celebrated today at the Royal Observatory in Greenwich, where he would take up residence as Astronomer Royal in 1720. Arguably however, it is the comet named posthumously after him that has had the greatest cultural impact among all of his works. In 1835, comet Halley (now formally 1P/Halley) returned again. Mark Twain, born that year, would later predict (correctly) his own death when it next appeared in 1910. 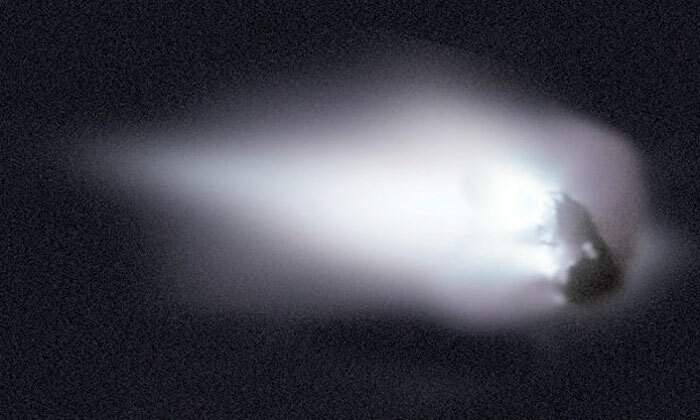 In 1986, technology and tenacity drove the European Space Agency (ESA) to rendezvous with Halley’s comet, guiding the Giotto probe 370 miles (600km) from its nucleus in an unprecedented feat of observation. This resulted in a considerable expansion of our understanding of its composition and evolution. It also laid the foundations for ESA to once again break new ground – literally – by touching down on the surface of 67P/Churyumov–Gerasimenko in November 2014. We can only imagine what Halley would have made of such progress. Though 1P/Halley won’t return to the inner solar system for over 40 years, the first known periodic comet still delights stargazers every October with the coming of the annual Orionids meteor shower, as we coast through a cloud of ancient icy fragments, originating from the comet’s volatile surface. Entering the Earth’s upper atmosphere at hypersonic velocities, they’re vaporised in a celestial fireworks display. Despite being a consequence of such a famous comet, the Orionids is a modest display, with an expected 15-20 meteors per hour, radiating from the east after midnight on the 21st and 22nd. Nevertheless, they are known for their speed and brilliance, and remind us that Halley will revisit us in the second half of this century. How much more will we know by then?